Adolescence is a time of "firsts." First kiss. First love. First loss. First job. The first taste of adult responsibilities, and the first look at an independent life away from both the restrictions and the security of home. And in this case, a very different type of "first" murder. 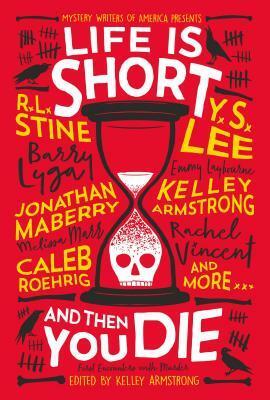 This short story collection of murder mysteries adds a sinister spin to the joy and pain of firsts that have always been a major part of life, whether it be high school cliques who take the term "backstabbing" too seriously, stumbling upon a body on the way home from school, or receiving a Snapchat message that promises something deadly. Kelley Armstrong has been telling stories since before she could write. If asked for a story about girls and dolls, hers would invariably feature undead girls and evil dolls, much to her teachers' dismay. All efforts to make her produce "normal" stories failed. Today, she continues to spin tales of ghosts and demons and werewolves, while safely locked away in her basement writing dungeon. She's the author of the New York Times-bestselling Women of the Otherworld paranormal suspense series and the Darkest Powers young adult urban fantasy trilogy, as well as the Nadia Stafford crime series. Armstrong lives in southwestern Ontario with her husband, kids and far too many pets.